The landscape of leading derivatives providers is being reshaped largely by a preference for low commissions and a newfound fear of having American banks as counterparties. It would not take a forensic accountant to trace the origins of the global financial crisis to credit default swaps that were exposed to subprime mortgages. Yet anyone who expected the subprime mortgage implosion in 2007 and the ensuing stock market crash in 2008 to scare investors away from using financial derivatives could hardly have been more wrong. As pension funds, hedge funds and mutual funds recovered from the crisis, traders, portfolio managers and treasurers said in interviews with Global Finance that their exposure to derivatives is actually increasing as a means of hedging against further volatility in the markets. "It's not 'Do I trade futures and swaps?' It's 'To what extent do I use them?'" says James Bennett Jr., managing director of Greenwich Associates, who led a 12-month survey of more than 100 institutional investors in the US on their use of equity flow derivatives, a category that excludes structured products, through June 30 this year. Fifty-five percent of those investors expected to "somewhat" increase their use of flow equity derivatives in 2011, and 80% expected their use of structured finance to remain unchanged. In fact, some money management firms that had shunned derivatives until 2007 saw the crisis as enough of a game-changer to make them start investing in derivatives. One is MSF Investment in Boston, which manages $204 billion in mutual funds and institutional accounts. "In the changed landscape of investing, people have started looking more and more at the lines between equity, fixed income and derivatives and started melting down the silos," says Michael Spalla, a trader at MFS. 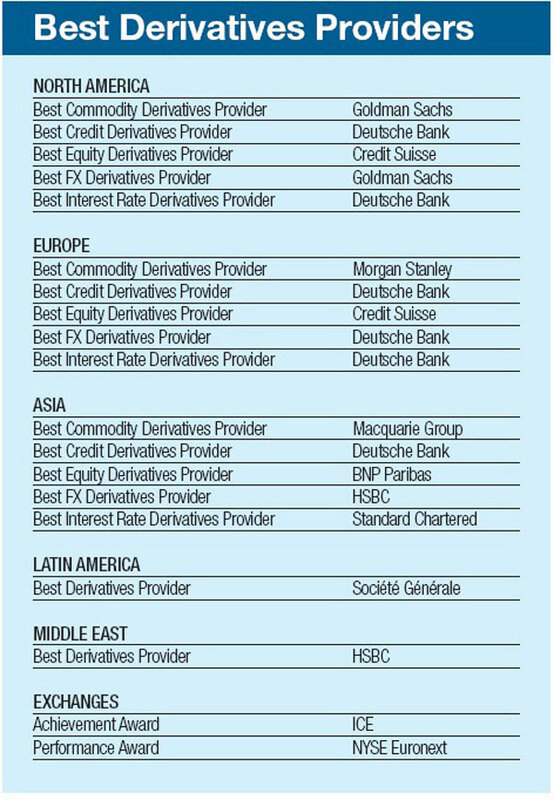 But research conducted for Global Finance's seventh annual World's Best Derivatives Providers survey shows that some providers are benefiting more from the newfound post-crisis interest in derivatives than others. 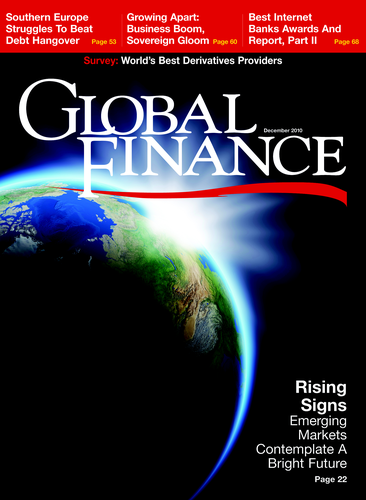 As the global financial system struggles to work its way out of the crisis and regulators in the US and Europe begin the painstaking process of derivatives reform, prime brokers, dealers and other derivatives providers find themselves staring across a dramatically altered market for options, futures, swaps and structured and more-exotic products. In what is likely to become the new status quo, providers are finding that they can guard their market share from competitors only if their clients perceive them as offering the lowest commissions and narrowest spreads, providing access to the widest selection of derivatives for investors to express their views, offering access to synthetic securities in some emerging markets where many banks are not even authorized to invest in plain-vanilla securities, putting their own balance sheets at risk to provide liquidity at panic-stricken moments when their competitors refused to do so, and still showing enough flexibility to innovate with new products. Driving this shake-up of derivatives providers is the introduction of what promises to be an unprecedented level of transparency in pricing. This is partly the result of the early stages of derivatives reform on both sides of the Atlantic. But long before regulators were publicly discussing bringing stability to the credit default swap market, the Intercontinental Exchange plunged in, clearing $12 trillion gross in notional amounts from July 27, 2009, to September 21 this year as a service to banks that arrange CDSs. "Going forward, regulators want trading in OTC instruments to be more like the exchange space, which means [it will be] more regulated, more transparent, more centrally cleared, more robust structurally and more competitive—meaning easier for users to compare prices," says Ed Ditmire, managing director for diversified capital markets research at Macquarie Securities Group in New York. Banks that embraced the full gamut of challenges during the crisis and still emerged in flexible enough shape to keep rolling out new products have grown their market share substantially over the past year and a half. Select European banks are taking business away from American banks—no matter how well capitalized the American ones are now. "Those who had the larger prime brokerage relationships probably had some clients saying, 'We need to spread it around a little bit because we don't know when the next Bear Stearns or Lehman is going to happen,'" says Bennett. "Deutsche Bank and Credit Suisse clearly were beneficiaries of that." But it's no longer enough for a bank to simply be willing to commit capital to facilitate larger options trades to be able to steal clients from a prime broker or dealer. "Competitiveness of pricing is far and away the most consistently noted factor," says Bennett, citing the results of the Greenwich survey, which involved more than 100 institutional investors in the US and more than 100 in Europe as well. In that light, Credit Suisse and BNP Paribas shine brighter than their competitors because, as one portfolio manager says, their commissions on equity derivative trades are so low that "I don't how they can earn a living." That's the kind of client feedback that coaxes a grin out of Grace Koo, head of the equity product strategies group a Credit Suisse in New York. "Investors want simple solutions that are cost-effective with good execution," she says. In credit derivatives a provider that is now known for low commissions and for not trying to make money on every single trade is Deutsche Bank, which another Greenwich survey described as a market share leader in US fixed income as of August this year. "The key to our business is that we trade as much volume as possible. We get the direction right because we capture trends and the bigger picture better that way," says Nick Pappas, co-head of credit trading for North America at Deutsche Bank in New York. Yet some banks still command a premium on the quality of the information they use to execute transactions, particularly those involving FX and commodities derivatives. Some hedge fund traders say they will put their faith in Goldman Sachs' "superior" information before any of Goldman's competitors. Yet in equity and credit derivatives, the same traders complain that Goldman charges such high commissions to get out of trades that they have gotten into with Goldman that they would rather go through the arduous paperwork of a novation to get out of the same trade with Deutsche Bank, BNP Paribas or Credit Suisse. As is normal in a market recovery, most activity is now concentrated in less complex transactions as institutional investors simplify their investment strategies. Take Robert Hunkeler, vice president for investments at International Paper in Greenwich, Connecticut, who says he stopped dealing directly in derivatives in October 2008, when long swap rates decoupled from long bond rates. At that time, he removed an overlay strategy from IP's pension plan, which had $6.8 billion in assets at year-end 2009. IP then hired NISA Investment Advisors in St. Louis to manage a customized strategy that uses derivatives. As more pension funds look for custom-made solutions it could create an opportunity for niche players with the capacity to provide bespoke transactions. A case in point is Société Générale, which sold a custom-made basket of hedge funds to a pension fund in Honduras and proprietary exchange-traded funds to another pension fund in Chile, says Samuel Rosenberg, head of sales at SG Americas Securities in New York. Robert Pickel, executive vice chairman of the International Swaps and Derivatives Association, says: "Looking at the more customized transactions, there may be different types of underlying risk where a firm that is creative or focused on customer service may be quite successful on a smaller scale." In the year ahead, a major differentiator between leaders and laggards will be their capacity to continue to roll out new products. "I am not suggesting that the pipeline for new products would shut down completely, but, relatively, you are going to see a greater emphasis on the need to anticipate and put in place the structures for the new rules over the next nine to 12 months," says Pickel. Nevertheless, new activity in derivatives is expected to continue growing overall, says Pickel. Of course, it may never return to the stratospheric heights seen at the beginning of the financial crisis. By the second half of 2009, the notional amount outstanding for CDSs had fallen 52%, from a peak of $62.17 trillion in the second half of 2007 to $30.43 trillion, and that for equity derivatives had fallen 43%, from a peak of $11.88 trillion in the first half of 2008, according to ISDA statistics. The decline is largely a function of matching trades having been canceled by counterparties at the behest of regulators, and does not reflect the resurgence in new activity, says Pickel. "We expect the rate of new business to continue," he adds.